Follow in the footsteps of these owners with vision, who have created their own Edens. Impossible n’est pas français,’ said Napoleon grandly, or words to that effect. For the intrepid David and Mary Thomas, ‘impossible’ wasn’t English either, when, in 1999, they set out to rebuild Grade II-listed mere Down House (Fig 1, above) in Wiltshire, an architectural voyage of discovery from which they emerged triumphant five years later. The decade since then has been the happiest of times for the couple and their Millfield-educated sons, but now, sadly, it’s time to downsize and their Wiltshire showpiece has been launched on the market through Strutt & Parker (01722 344 010). Mrs Thomas remembers mere Down House as ‘a mean, miserable little house’ when she and her husband bought it in 1997, although its origins were impressive enough, its construction—of silvery local stone under a Cornish slate roof—reassuringly solid and its situation peerless. 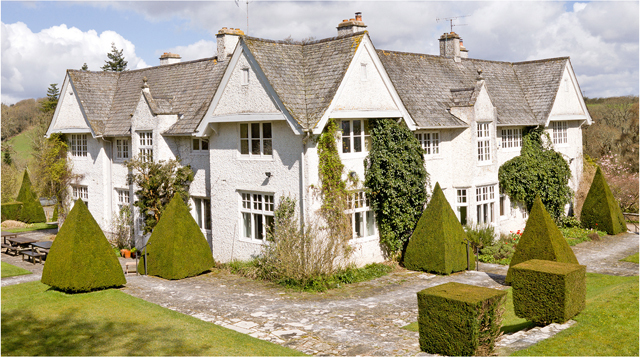 Built on Duchy of Cornwall land between 1920 and 1922 for the daughters of a shipping magnate friend of Edward VII, it sits in a glorious position in chalk downland high above the pretty, unspoilt town of Mere, which was first settled in Saxon times. Surrounded by swathes of Duchy of Cornwall and National Trust land within the West Wiltshire and Cranborne Chase AONB, the house enjoys direct access to a vast network of paths, riding tracks and open downland, once traversed by the Romans and now inhabited by a huge variety of wildlife. A well-informed passion for late-17th-/early-18th-century English domestic architecture, allied to an appreciation of traditional French and Italian country-house design, was the inspiration behind the Thomases’ plans for the ‘new’ mere Down House, with its striking millennium tower and loggia based on Mr Thomas’s mother’s house in Lot-et-Garonne, and Mrs Thomas’s pet project, a Lutyensesque courtyard with a two-car ‘motor house’, a machinery store and an upstairs room that could also be used as an office. Fig 2: The Thomases have redone the interiors to create an elegant family home. The greatest innovation has taken place inside the house itself (Fig 2), where a collection of small rooms has been transformed into a cheerful confusion of chambers of varying colours, shapes and sizes, each with its own particular charm, and showcasing the use of wide, wax-polished oak floorboards, oak panelling and antique marble flooring in the hall. The vast, pale-blue kitchen/breakfast room, with its friendly, four-oven Aga and well-fitted larder, is the sunny heart of the house, with dual-aspect windows overlooking the enchanting gardens to the south and west. A pretty, Georgian-style, main staircase—exquisitely worked by local craftsmen—leads from the brightly coloured hall to three double bedrooms, an oval-shaped library and a study on the first floor; above the library, the tower staircase leads to a further double bedroom. And, throwing away the country-house rulebook, the master suite has been located in the roof. ‘The views of the garden would have been wasted on the children,’ Mr Thomas explains. The planners must have raised their eyebrows at the idea of the octagonal tower with its conical roof inspired by the houses of the Dordogne, but Mr Thomas got his way. As, it appears, did Mrs Thomas in her areas of special interest, notably the design and layout of the gardens—parts of which were recovered from the remnants of the 1920s original and the rest of which she planted with chalk-loving species such as Daphne bholua and other hardy Himalayan plants. The purchase of an additional five-acre paddock from the Duchy allowed her ample room to spread her gardening wings over the years: ‘You can’t grow annuals here, so we created a cutting garden to provide flowers for the house, which give us wonderful colour for 7–8 months of the year,’ she adds. Even now, architect Jonathan Harker, of the Llewellyn Harker partnership in Shepton Mallet, Somerset, chuckles as he recalls the Thomases’ ‘wonderfully anarchic’ approach to the entire rebuilding project, which, thanks to the application of sound architectural principles and the skills of a supremely talented workforce, has realised the vendors’ dream of combining ‘all the very best of old and new’. Both of which are also happily combined at Sherwood House (Fig 3), near the village of Newton St Cyres, five miles from Exeter, Devon, which relaunches on the market this week at a guide price of £1.5m through Savills (01392 455700). For almost half a century, until his death in 2009, Sherwood House was the home of the late Sir John Quicke and his wife, Prue, who between them developed one of Devon’s most magnificent woodland gardens across two steep-sided valleys surrounding the house. A forward-thinking farmer and agricultural innovator, Sir John and his children belong to one of the few Saxon families who have retained land in the South-West since before the Norman Conquest. The gardens were originally laid out before the First World War and their sheltered habitat is ideal for even the tallest magnolias, of which Sherwood boasts some 230 varieties. These start their display in mid March and bloom, along with the camellias, until the end of April. The rhododendrons take over in May, with deciduous azaleas providing a splendid show in late May and June. The year rounds off in october and November with autumn colour provided by berberis and maple trees. In the coming weeks and months, with the spring trees and shrubs springing into leaf, ‘driving up the long no-through road to Sherwood is a magical experience,’ says selling agent Richard Addington. 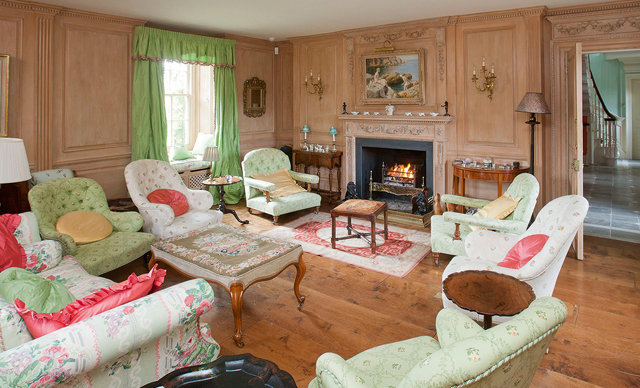 The spacious main house, arranged around a central courtyard, has recently been occupied by two generations of the vendor’s family and adapted accordingly, but the house could easily be restored to its original design, which would include four or five good reception rooms and up to 10 bedrooms, Mr Addington suggests. Sherwood House and its 25 acres of garden, (with a further 50 acres of land available if required), are supported by a range of outbuildings and a cottage, still home to gardener Vaughan Gallavan, an expert plantsman who has worked at Sherwood for more than 30 years.